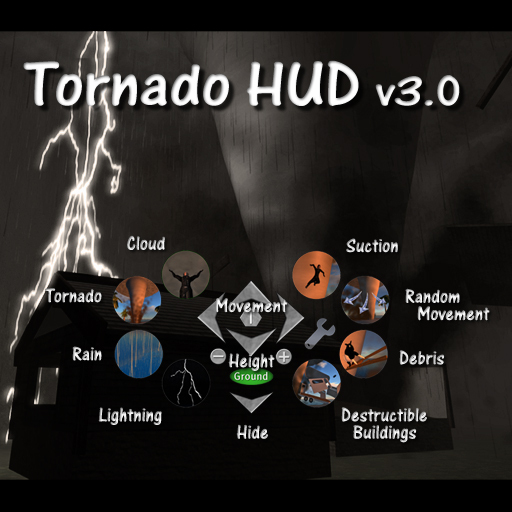 The Tornado Summoning HUD allows you to summon a 40 meter tall sculpted tornado, complete with particle effects, sound effects, realistic rain, snow and lightning, 30 types of debris, remote control movement, random movement and avatar suction (via a distributable hud), giving you complete control over this force of nature! Destructible buildings are now sold separately as the 'Tornado HUD Destruction Kit'. This kit includes sample buildings and the scripts you need to create your own! The tornado will now work at any height up to 4076 meters. When summoned above 30 meters from the ground the tornado will automatically appear level with your feet. Below 30 meters it will default to following the ground as before, but this can be adjusted manually at any time using the new plus and minus buttons. A height readout is shown on the HUD and the height can also be altered while your tornado is summoned. Please be sure to read the main features listed below so that you are fully aware of all features and restrictions before purchase; This HUD is provided as copy/no mod/no transfer so refunds cannot be given! CAUTION: Like many of the fun things in SL, misuse of the Tornado Summoning HUD could violate the Second Life Terms of Service and result in you being banned! You know the rules and I encourage you to follow them. I take no responsibility for actions carried out against you by Linden Labs or any other party as a result of the misuse of your Tornado! When properly warned this tornado will often draw a crowd of willing participants, so be respectful, tell people what it does, and have fun! If you have any questions or would like a personal demonstration, feel free to IM Tryptofaa Sands in game. The Tornado HUD is restricted to one tornado rezzed per avatar at any time. The rezzed tornado and the HUD keep in constant region-wide contact. This means the tornado will automatically delete itself shortly after the owner leaves the sim, goes off-line, or detaches the HUD. Your tornado is incapable of crossing to another region under remote control, or with random movement.